We are very pleased to announce the second round of Placemaking Plus two-day Training program is coming up this fall. During the Training 'Placemaking in practice' various questions and practical examples are discussed of placemaking's how and why. The Training takes place from Thursday 01 November to Friday 2 November in Amsterdam. - Why and how do you start with Placemaking? - What influence does Placemaking have on the design and in doing so on your planning? - How do you reach the right parties and how do you make long lasting contact? - What is a Place Game? - Why, how and when do you form a Place Management Team and a coalition and what are the differences? - What do we mean by 'Quick wins' in placemaking? - How does the 10 out of 10 approach work, also called 'The Power of 10'? - What happens on the street? What opportunities do Placemakers see and how do they bring that to the attention? - Which techniques can you apply? - What are the consequences for the budget and how do you deal with this? Are you a student? 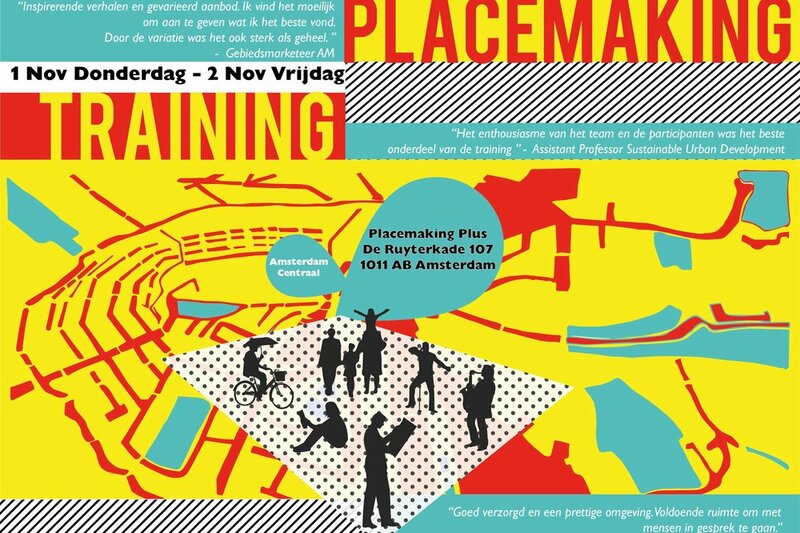 Do you want to be a part of the Placemaking training in Amsterdam? We invite motivations from students, 150 - 200 words regarding why do they want to attend the Placemaking training and how can it help focus their career and studies thereafter. You can go creative and also send us a concept image. The submission has to be one A4 with text and image, your choice and decision. The best entry wins a ticket for free for the 2 days training on Placemaking in the heart of Amsterdam (group of 30 participants in total including people from municipalities, entrepreneurs, managers, etc. Last date of sending your entry is 20 October, 2018. Looking forward to the responses. We offer a ticket for 150,- Euros excluding VAT, to all the other non winning entries. Please note that the training is only offered in Dutch!